Throughout history, military engagements have altered the course of historical events, causing major changes both on a global scale (the battles of Yarmouk & al-Qadisiyyah in 636 determined the religious/linguistic orientation of the Middle East that persists today) as well as within individual cultures (the 1836 battle of San Jacinto gave the United States nearly one-third of its continental territory). For these reasons and more, the study of pivotal battles is a highly useful analytical tool and an important component for understanding world history. 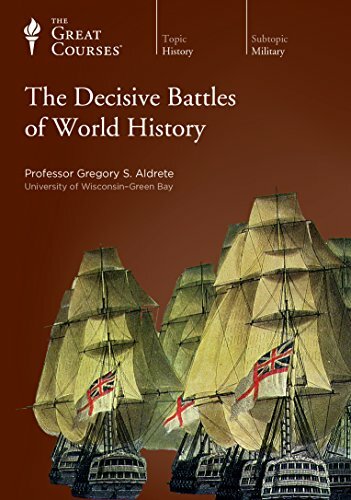 In these 36 dynamic lectures, Professor Aldrete leads you in discovering the military conflicts that have had the greatest impact in shifting the direction of events and defining our world. Across 4,000 years of history, you'll explore nearly 40 key military engagements, from the milestone battles of Western civilization to their counterparts in the Middle East, India, and Asia. Through his dramatic and evocative descriptions, using special maps and animations, Professor Aldrete brings the events vividly alive, taking you through the moment-by-moment unfolding of each battle. Throughout the lectures, he uncovers fascinating background material that highlights the drama, poignancy, and scope of the experience of war. This engrossing course provides unique insights into world civilizations by revealing the profound impact of military battles in human history.